will not trouble us at all but there is more to them then cleaning off the front of our vehicles after we abruptly end their lives in unreported vehicle accidents. 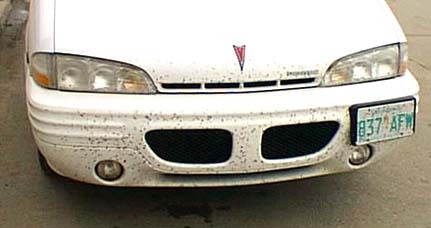 But, some of those creatures are blood suckers who consider us as the necessary element in their process of procreation and soon after we see this sort of thing on the fronts of vehicles we will start to feel them boring holes in our skin to remove blood and leave an itchy welt on us. The only good thing I can report is that in five months lower temperatures will eliminate them for six more months.